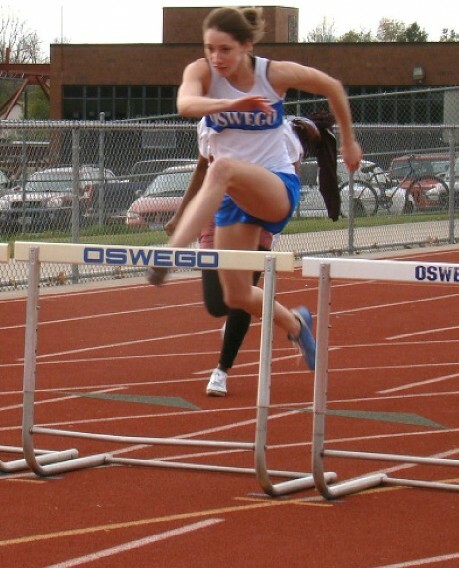 OSWEGO, NY – Eliza Parker is bound for the New York State Track and Field Championships once again as she qualified for the 100 hurdle competition. Meanwhile, the boysâ€™ varsity track and field team wound down the year and the boysâ€™ modified lacrosse team finished a perfect season 10-0. Oswego senior track standout Parker turned in an outstanding performance for the Lady Bucs at the Section 3 State Meet Qualifier Thursday to earn a return trip to the New York State Track and Field Championships. The championships will be held June 11 and 12 at Vestal High School in the Southern Tier. Parker shattered her previous best in the 100 meter hurdles with an outstanding time of 15.37 to advance to the state finals. She also earned a personal best in the 400 meter hurdles, with a fine time of 1:06.02, to place second, just missing the state cut time. Parker also ran a leg on the Lady Bucsâ€™ talented 400 meter relay of Cydney Ward, Alexis Files, and Whitney Ford, whose strong time of 53.17, earned them 7th place among the section’s elite. Ford also placed 8th for Oswego in the 100 meter dash, with a fast time of 13.4. Members of the Oswego High School varsity boysâ€™ track team took part in the State Qualifier Meet on Thursday at Cicero-North Syracuse High School. â€œAlthough we didnâ€™t qualify for the state meet, the boys participated on a high level. Most had personal bests as they never quit. I was very proud of the way they competed,â€ Oswego coach Erwin Dewey said. The Bucsâ€™ 4 x 100-meter relay team continued to be consistent as it broke the school record for the third time this year. The relayâ€™s time of 45.05 was good for 5th place in Division I. Running on the relay were Cory Keefe, Brent Denny, Dan Cirino, and Ryan Jock. Eli Tyler completed his senior season with a personal-best time of 57.13 in the 400-meter hurdles, placing 3rd. â€œEli had a good season as he led the team in scoring,â€ Dewey said. Keefe finished sixth in the 100-meter dash as he had a fast time of 11.37.
â€œAs a freshman, he was second on the team in scoring this year,â€ Dewey said. Jock finished a fine season as he took 6th place in the long jump (18â€™ 11.5â€). Mitch Maniccia concluded a strong senior season by placing 8th in the shot put (44â€™ 4â€). He was 5th in points this season. â€œThese seniors scored many points and will be missed next year. They did a good job,â€ Dewey said. The Oswego modified boysâ€™ lacrosse team finished 10-0 with a season ending 6-3 win over Henninger. Ryan Martin had two goals and an assist while Brandon Tracz and Mitch Schrader each scored a goal and added one assist. Jon Buske and Shane Bowman each added one goal. Garrett Dunsmoor contributed an assist. In net, Trey Love had six saves and Hunter Izyk four. Oswego concludes the season with a 10-0 record and a 21-1 record over the past two seasons. Team members included Garrett Dunsmoor, Jake Gardner, Mitch Kerley, Hunter Izyk, Shane Bowman, Jon Buske, Jake Cary, Sean Mooney, Dalton Tracy, Max Torbitt, Pat Manion, Matt Wise, Jacob Rodriguez, Brandon Tracz, Trey Love, Nick Reiner, Brian Williams, Eric Doviak,Pat Baer, Angelo Gentile, Jordan Sherman, Ryan Martin, Zach Zerrahn, Greg Mayer, Justin Canale, Devon Hillman, Zach Crisafulli, Ben Annal,Â Sean Tracy and Mitch Schrader as coach. Mike Martin continued his success behind the bench.